Wow! What a week! I had hoped to get the loom put together, but it was too busy. I did get all the heddles loaded onto the rods in the shafts. Here it is with just two shafts loaded, and there are four, but I did finish that part. There are enough heddles (those things that look like wires hanging down in the middle) to weave something with more than 400 warp threads. 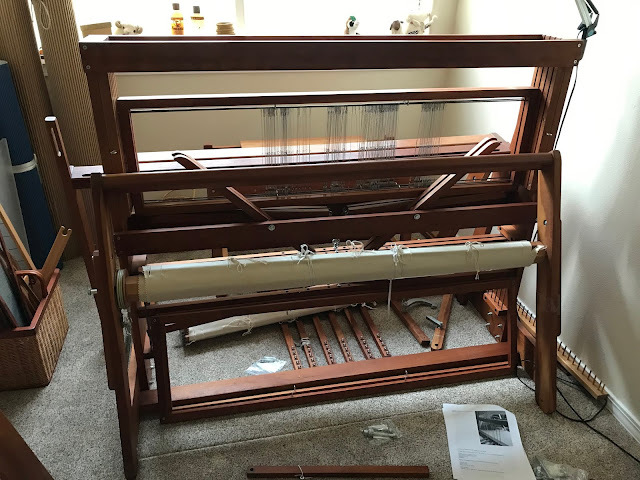 The heddles hold the warp thread, and the shafts can be lifted in various configurations as the weaver works with the weft thread on a shuttle. I hope to make some rag rugs for the house, and then (after I have the techniques down) for gifts. The arrival of the final part of our shipment on Wednesday stopped the work on the loom, as there were other things to be done. We were glad to have it come, because most of my kitchen equipment was missing or partly missing. (How can you use a blender if the container is missing?) We were lucky to have our 5th wheel parked in front of the house, and we ended up using most of the pots, pans, cutlery, knives cutting boards and towels from the trailer in the house. I'm still missing things, but we are still unpacking. Wednesday evening the kitchen was unusable because of all the boxes piled on the floor. That's just the kitchen, mind you, and the breakfast bar was/is still covered with papers, DH's computer and some other stuff he will have to remove, so my job in the kitchen is now just to clean up after us. 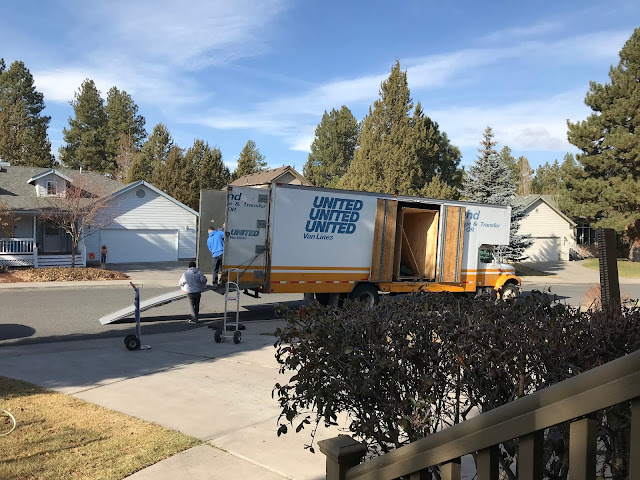 I took time off from unpacking on Friday to advertise our packing materials on the Redmond, Oregon, Online Yard Sale Group on Facebook. 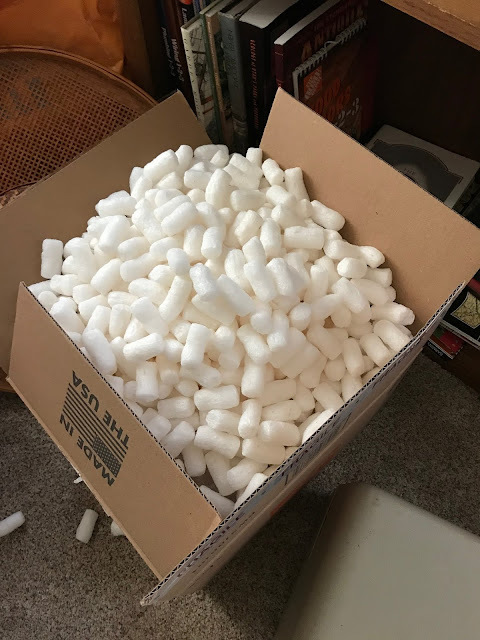 We had this overflowing box of foam peanuts. 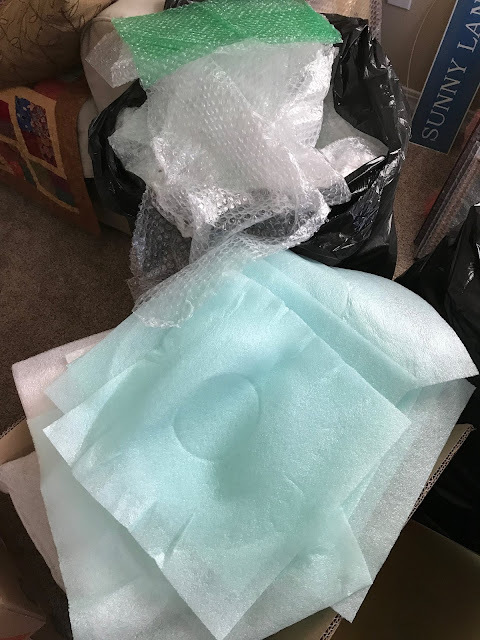 Then we had this large garbage bag full of bubble wrap (which had been tempting me to sit and make pop-pop instead of working), and an overflowing box of foam sheets and envelopes for putting between dishes. 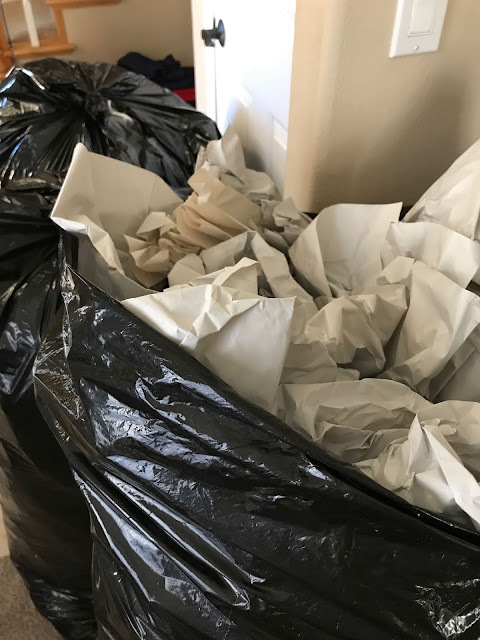 We had seven or eight of the giant yard trash bags full of clean, wadded-up newsprint. Then we must have had 40-50 boxes of various sizes, opened and flattened. A nice young woman responded to the listing and said she would take it all. She had four children, and their landlord had said they had to move because he wanted to sell the house in the spring, and needed to start working on it. She came Saturday afternoon and got it all...in four trips with her large car (family of six, remember) packed. We are gradually meeting some of the neighbors. DH was working out in the front yard, trying to tidy up our lawn hoses, when a gentleman from across the street stopped to talk. We found out from him that the previous owner had spent a month working in the house, fixing things. We can kind of understand his perspective now, how he didn't understand that we had such a long list of things to fix and wanted him to come down on the price. He had seen the house before he spent that month fixing. I'm glad we didn't see it then. We probably would have written it off. In spite of all the things we've had to replace, we're starting to feel like it's going to be a nice house. We keep discovering things we like about it. For instance, I hated to give up my laundry chute in our bedroom closet, which dumped laundry right into the laundry basket in the middle of my laundry room. Here I don't need a laundry chute, because the laundry is upstairs with all the bedrooms. All I have to carry down the stairs is the kitchen towels, cloth napkins and the occasional tablecloth. Another fun thing about this house is that small planes land on a landing strip that is next to our street, but further to the north. 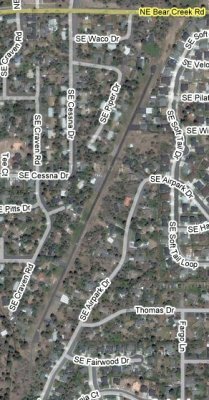 We live on SE Airpark Dr., but off the bottom of this photo. Occasionally a plane will come down just above the trees across the street to land on the strip. We watched one sail over us on Saturday. It will be fun if we can see one when the grandkids are here. It reminds me of when I was a small child, spending the summer with my mother and brother in New Hampshire, in a cabin just across the train tracks from Silver Lake. We saw an aquaplane land on the lake one day. The trains were fun, but that aquaplane was unusual. We hear the trains frequently here, too, which brings back pleasant childhood memories. I think he looks a little like our youngest grandson, so I have named him William (Billy) Johan (for the grandson) Gotz (for the doll company). I haven't cut his hair yet, just pulled it back in a low ponytail. My hairdresser offered to help me with the haircut, but she was leaving Saturday morning from LA for a cruise for two weeks. Billy says he doesn't mind waiting for his haircut, because he wants it to be right. So the hair will become part of the story. 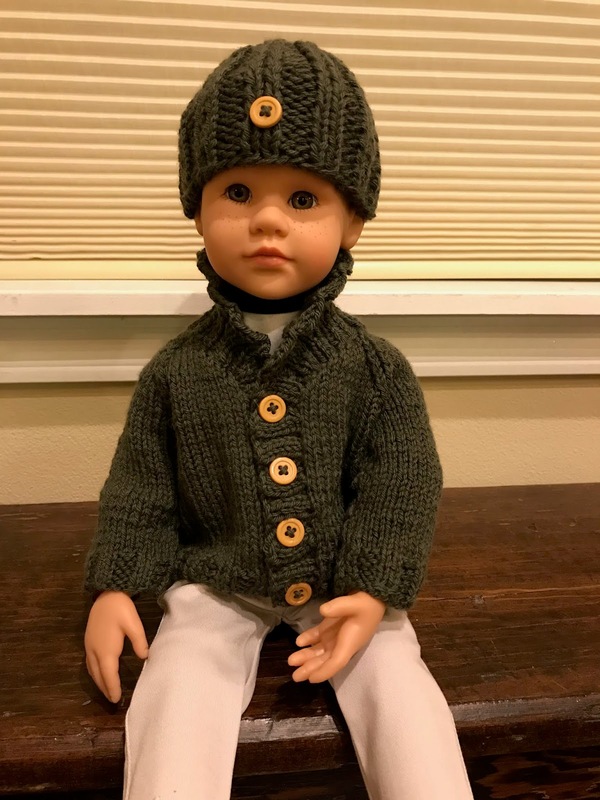 He looks pretty masculine in his cardigan and hat. The girls will love the clothes. I like him better as a boy, I think. This week's story was about recycling. I think I'm getting divine inspiration. I didn't know this was National Recycling Week in the US. Saturday morning we went with my BIL to the Holiday Food and Gift Festival at the Deschutes County Fairground in Redmond. 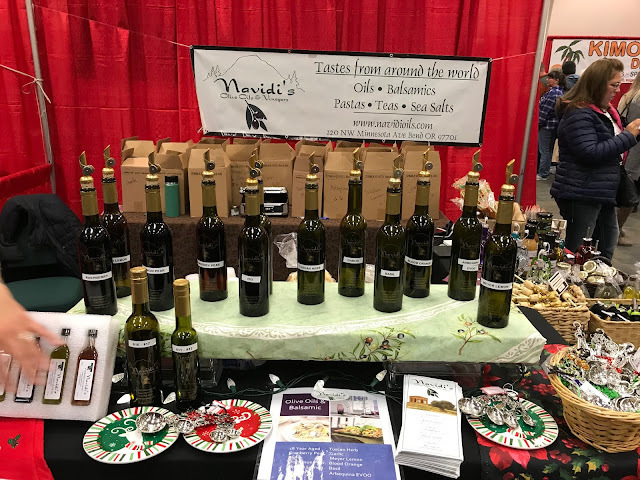 They had some interesting booths, offering wine, spirits, oils, vinegars, fudge, salsa, shortbread and other tasty treats. This place has a store in Bend, which we plan to visit sometime soon. There were also several booths with quilted and sewn items, like table runners and aprons. This lady also had knitted dish cloths. 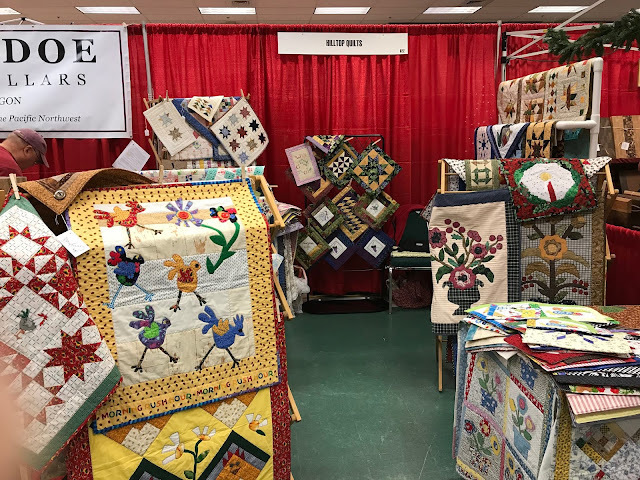 This booth has some lovely items, Hilltop Quilts. The owner doesn't have a website, but she gave me her card. Her phone number is 971-645-8772, and her name is Rita. 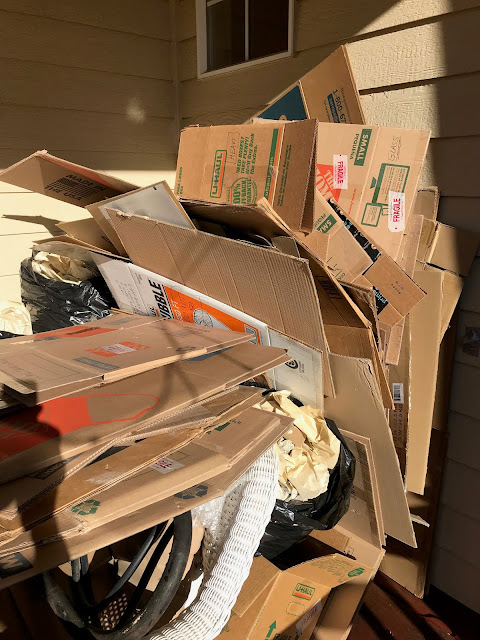 She says she's living surrounded by boxes, too. She moved three weeks ago. Here's the booth for Imperial Yarn. 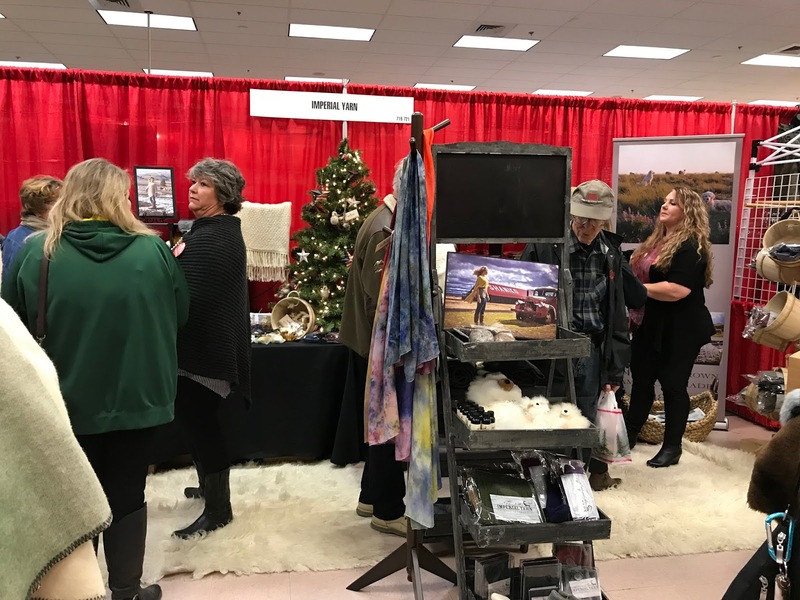 We bought some of the dryer balls, which you can see (barely, because we got the last package) in the top tray of the stand in the middle of this photo. They are made from felted alpaca. You can add them to your wet clothes in the dryer, and they function as dryer sheets do, to reduce static electricity and soften clothes. You can also add a few drops of essential oil of your choice to add a nice scent to your laundry. I already knew about them from my visits to the Blue Moon Ranch Alpacas in Utah. We bought a new lampshade with a silhouette of a family of bears and some trees on it, and a hummingbird feeder made out of a fence post. We also picked up a bar of special soap for each of the younger grandkids from Penelope's Soaps and Such. (Each bar contains a LEGO Harry Potter character.) They will want to wash and wash to get the figure inside. You may remember that we had to take Rocky to the vet on Sunday. By Tuesday, he was running and playing with Dusty in the backyard, and I had dropped the pain medication, just keeping the anti-inflammatory medication. We have an appointment for Rocky for November 20th for his intranasal Bordetella booster, as well as a check for blood pressure and thyroid, to make sure his medications are working. My BIL is coming for Thanksgiving, and (if no one gets sick), our Oregon son and DIL will come down from Beaverton on Friday with their two boys to spend what's left of the long weekend. My foot has gradually improved with the treatment prescribed. I wish I could have gone to our new doctor before all the other attempts at treatment, but I'm so grateful to be able to sleep at night and to walk around without discomfort. I have much to be thankful for. Which reminds me, Thanksgiving is coming this week! Here's my favorite offering for my quilting friends at Thanksgiving. What's on my needles: Back to the Viipuri Cardigan for Jolena. 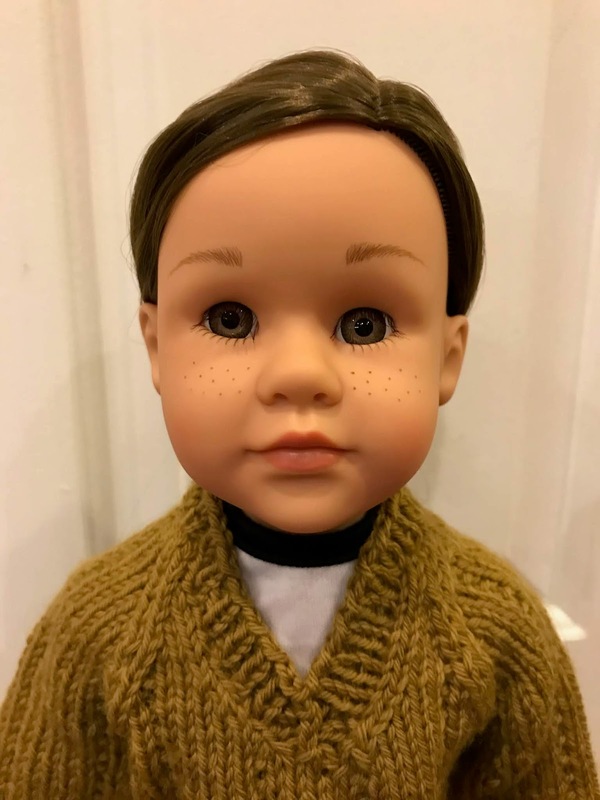 What's on my Sparrow 15: Still sitting in my future sewing room. 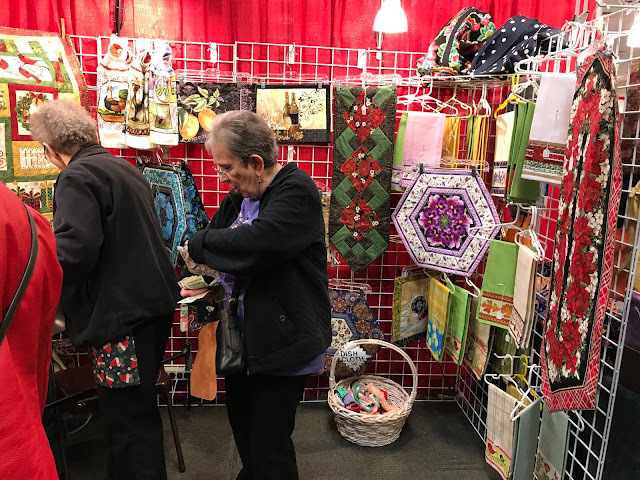 What's in my hoop: Still the Spring Flowers quilt, no progress this week. 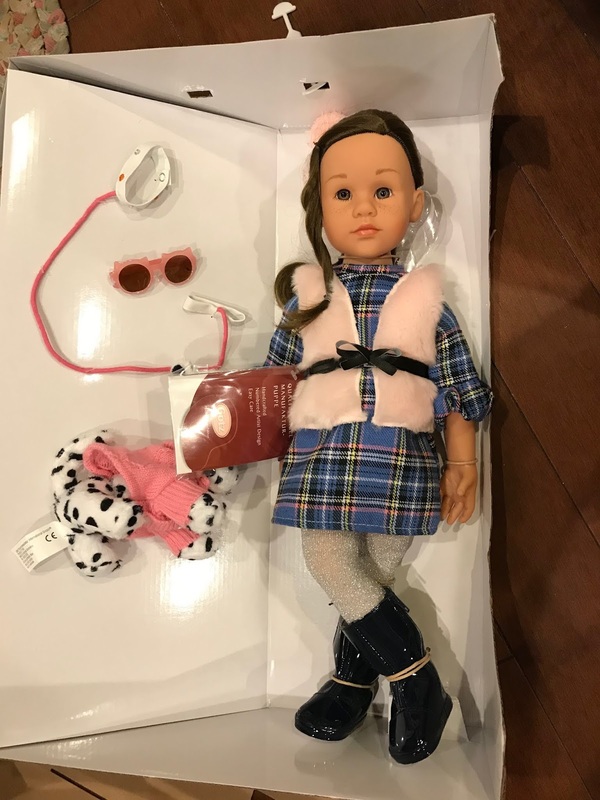 What's in The Doll's Storybook: "Reading, Writing and Recycling." This week's story is about doing homework and recycling, oddly enough, from the title. I'm working on the story introducing Billy. What's on my iPad/iPhone: The Ladies of Ivy Cottage by Julie Klassen. I've made some progress with the story. What's in my wine glass: Terrain Vineyards, California Red Blend, 2015. What's my tip of the week: I keep a basket at the bottom of the stairs for stuff that need to go up. It's elongated, so it doesn't take up much space but holds a lot. It saves time and effort. I’m figurIng out which quilt goes where today. I’m finding I have to decide based on size, which is working out for the best anyway. I have to make sleeves for the ones going on the walls. The Oregon kids are coming later. I am happy your remaining shipment has arrived. Now you can finish moving in. 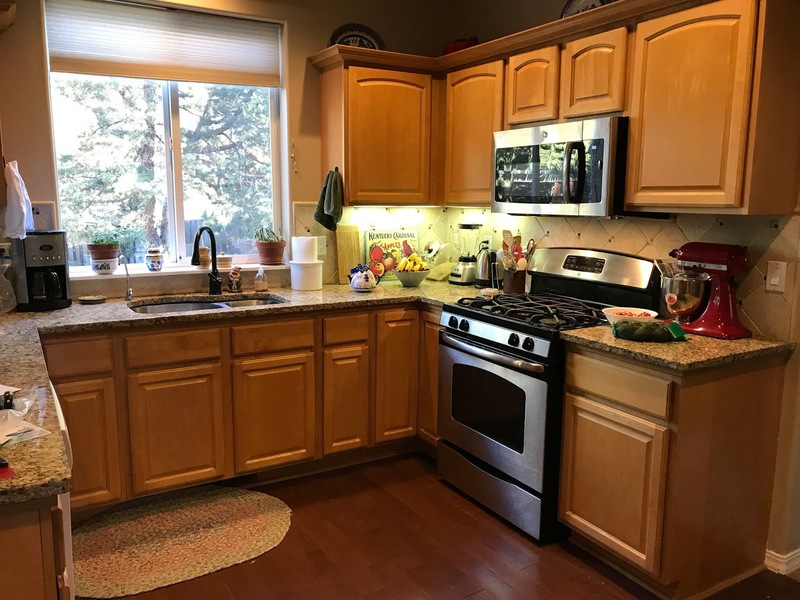 The kitchen looks great! Rebecca, someone who read my blog post contacted Penelope's and ordered some for her grown sons. Writing is easy for me as long as I have a topic. My last job was editor and writer for a trade publication. It was the best job I ever had. It's creative and it refreshes me. Cleaning, packing, moving, unpacking, organizing. Not my favorite things. If I had known how difficult it was going to me, I think I would have asked to stay put and live with the snow for the rest of my life. Yikes! Yesterday I took a few hours to put together this week's story, and I found I had the energy afterwards to do things I had been putting off. 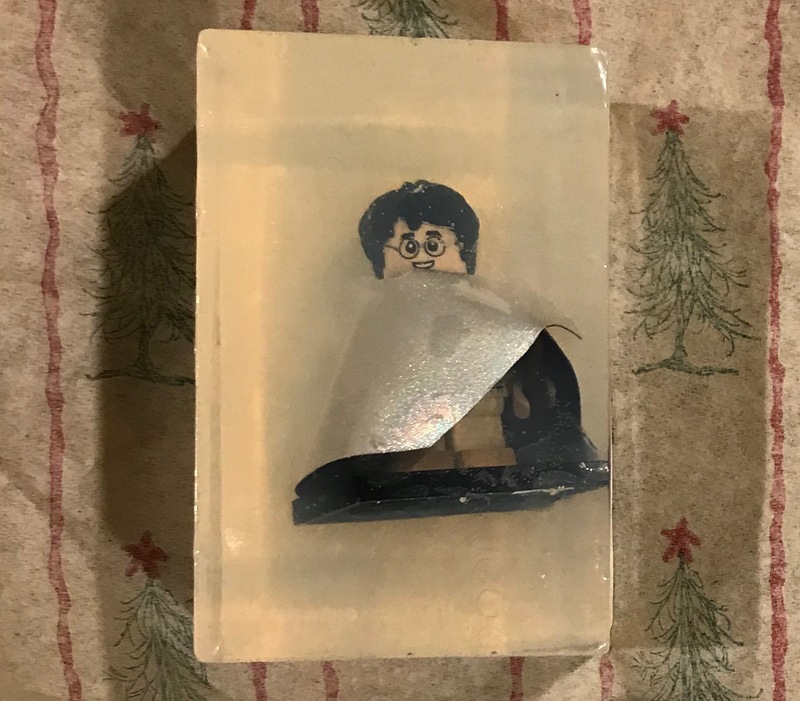 What a clever idea to put those Lego figures in the bars of soap. If someone who makes soaps in my area did that, I'd certainly buy from them. My granddaughter would love it! Each week I am amazed at how much energy you have! 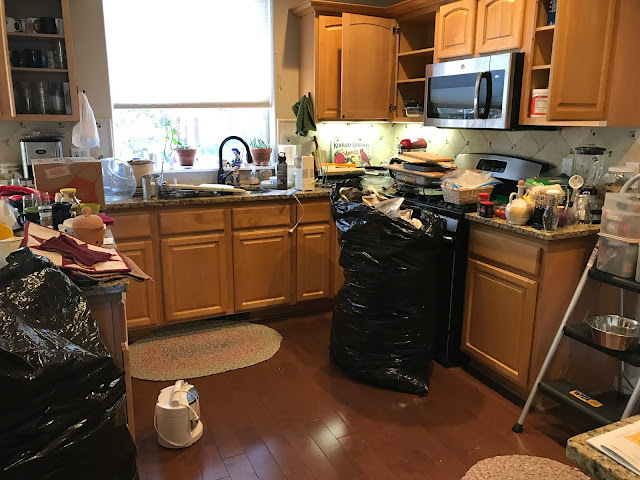 The idea of tackling a move like you and your DH have just completed, along with the things to do in your new home, the weekly Doll's Storybook, and your entertaining blog posts each Monday....well, I can't imagine mustering that much energy myself, and I consider myself to be in pretty good shape. (for my age, that is) Wow! Just wow! It sounds like you are slowly but surely getting settled in your new home. Our 2nd oldest grandson's name is William. We still call him Billy but he really prefers to be called Will.